These are created for additional details to be used in checkout processes that involves billing, payment, shipping etc. For instance, 'last name' of a customer is not required for billing but it is required for shipment. So, it is created as a custom field and made to be displayed in shipping address. There are two types of custom fields, namely, Core custom fields and Non-Core custom fields. 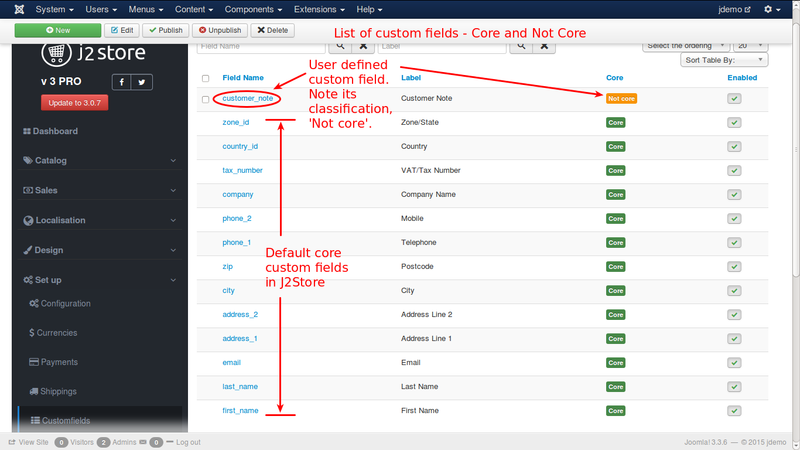 Custom fields that are in J2Store by default are Core custom fields and that are created by users are Non-Core custom fields. Core custom fields can be edited as per users wish but it is not advisable to make changes to Core custom fields except changing the name and label of the fields. 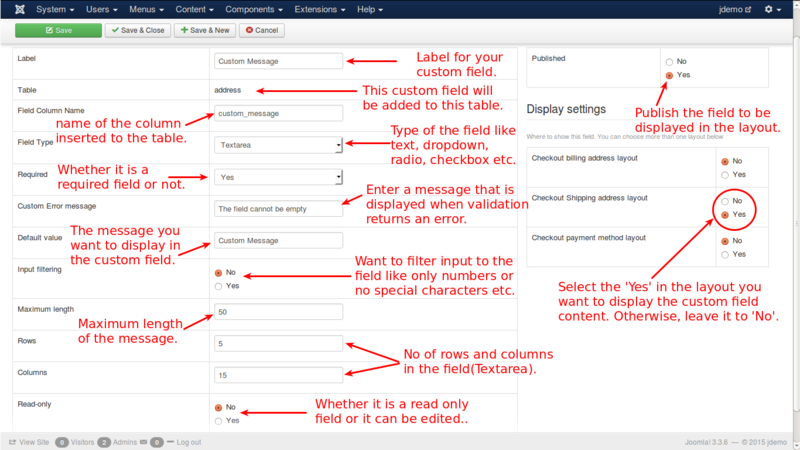 Apart from these core custom fields, you can create your own custom fields according to your requirements. For example, if you want to add a custom note for your reference, you can create it as a custom field and make it to be displayed in the billing or shipping process. Let us see how to create a custom field. In the custom field list view, click the New button. You will the get a screen as shown in the image below. Published - To display the field it has to be published by setting this option to 'Yes'. You can find the three layouts (billing address layout, shipping address layout, payment method layout). Here you can edit the billing and shipping layouts by re-ordering the fields or by adding new fields(custom fields). For example, if you have created the field called custom_address3 with the selection of billing address layout in custom field display settings and if you want to display it in the checkout layout, add it in the billing layout section in the J2store configuration checkout layout tab.